Not a Cake Bite. Not a Cake Pop. Its a DONUT BITE! Finally! 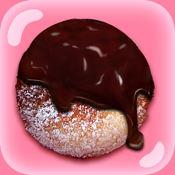 A fantastic Donut Maker that is let’s you creatively design donut holes just the way you like them! No more plain and boring donuts. Drench your donut in sugar or frosting or sprinkles …or ALL 3! Mmmmmm....Cover your donut in tons of your favorite toppings and make the donut of your dreams with Donut Bite Maker! After you are finished making your delicious donut take a bite and savor the flavor!